Unless you’ve been out of the country or sleeping under a rock over the last few days, you’ve probably seen the headlines. "Zombie deer" — a term that some sensational headline writers have created for the deadly deer malady known as Chronic Wasting Disease, or CWD. With all the national talk suddenly making the news cycle rounds — for a disease that has actually been around for a few decades now — there’s certainly no shortage of opinions about the disease, it’s risk to hunters and what to do about it. In fact, there seems to be little middle ground with the various camps out there being deeply divided over the disease itself and what the future of deer hunting is. What should hunters make about all this sudden talk concerning zombie deer? We turned to Dr. Deer — NAW’s Dr. James C. Kroll — for his take. North American Whitetail: What is your take on the “zombie deer” stories that are suddenly being found all over in news headlines? Dr. James Kroll: It is no more proper to refer to CWD as “zombie deer disease,” than it was to call it “mad deer disease” back in 2002! As far as I am concerned, the term is sensationalism at its worst, probably for headlines. The term “zombie” is defined as “a corpse said to be revived by witchcraft, especially in certain African and Caribbean religions.” This hardly fits the symptoms of deer in the clinical stages of the disease. NAW: It’s been reported in recent days that LSU researcher Dr. Frank Bastian indicates that CWD may not be about prions, but instead a bacterium. And news reports also indicate that he may have found a cure for CWD. What’s your opinion on all of this? Complete an application for a Conditional License. Protection efficacy experiments have to be completed, taking several more years. Submitted for a Complete License, which applies to just that one host species. The fact they assert that this would be a cure, again is naïve, in that vaccines do not cure anything and never have! First of all, CWD erodes holes in the brainstem, and brain tissue cannot regenerate itself! They imply that it will be a protective vaccine, again very naïve! There never has been a vaccine that protects 100 percent of individuals in the population. If it were developed, it would be useful to the deer farming industry, but would not be feasible for wild deer. As we have vividly learned for other wildlife vaccines, delivery is the major problem. It has to be species specific and have no effect on other species; and, be picked up by all individuals in the population. Even the much-touted oral rabies vaccines are not 100 percent effective. As much as I would love for it to be true, it is never going to happen! The major impact of all this is, it gives false hopes to the entire deer and hunting industry. NAW: In your estimation, where do we stand with CWD right now? NAW: Anything else that you’d like to add? DJK: Yes, it has been asserted many times that CWD has the potential to destroy deer populations and deer hunting as we have known it! The sensationalist reaction by professional biologists and the media has managed to accomplish the latter! 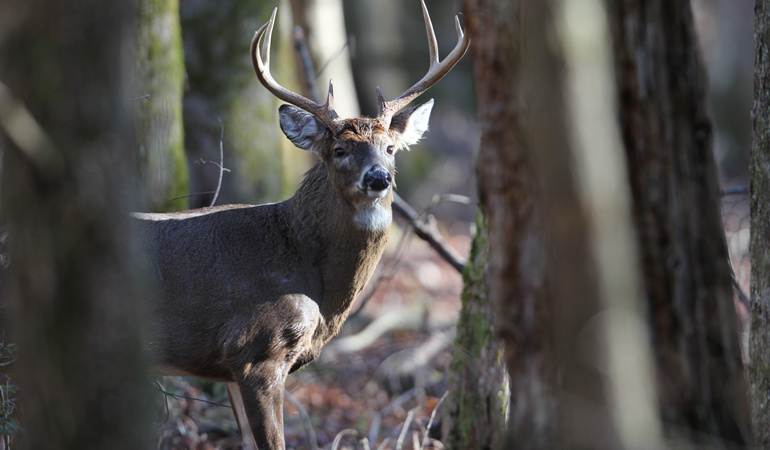 When CWD showed up in Wisconsin, three tabloids published articles saying that three men had died from eating venison tainted with CWD. That proved to not only be untrue, but patently false! That alone caused a 12 percent decline in deer hunters in Wisconsin, and they have never returned. It now is affecting deer hunting and harvest, with a decline of as much as 15 percent – all because of panic by agencies and biologists. If I wanted to destroy hunting in America, of which about 80 percent is deer hunting, I would convince hunters and the general public that one of the most healthy food items produced naturally in the deer woods was unwholesome and deadly! THAT would mean the end to deer hunting as we have known it; and it is my deep opinion that the whitetail deer will still be with us! And, the wholesale destruction of habitat caused by over-population would indeed lead to declines in deer numbers.